Please tell us your first name. Please tell us your email address. The death of a child, of any age, brings heartbreak and devastation. Whether your child died recently or some time ago, Bereaved Parent Support is here to help you find hope, healing, peace, and a way forward. Look here for articles and personal stories from others who have faced a similar loss. You can also find out about our telephone befriending service and events especially for bereaved parents. Find out about our befriending service and events, or sign up to the BPS newsletter. Read about how others have coped following the death of a son or daughter. Help and practical support for you on your grief journey. For all the latest updates and further support for those who have lost a child, like our Bereaved Parent Support page on Facebook. 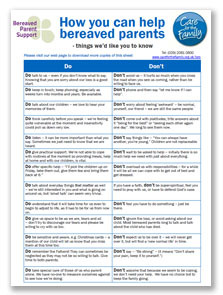 How to help bereaved parents Download our free resource sheet "How you can help bereaved parents", for anyone supporting a bereaved parent, it is based on real-life experiences and contains some practical tips on helpful things you can say and do - and those things best avoided. Sign up to receive the Bereaved Parent Support newsletter. Read our latest newsletter here.